I love the pictures of the lights. 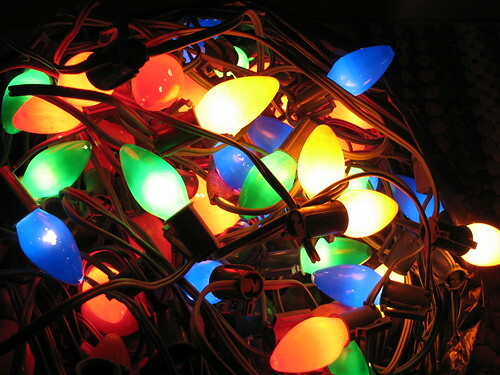 They remind me of the annual trials we encounter for as long as I could remember of untangling the lights, checking for bulbs that won’t make it to the tree this year and the dance we do with the tree to try and embellish the already beautify tree that will protect our Christmas gifts and memories. This year I didn’t put up a tree. 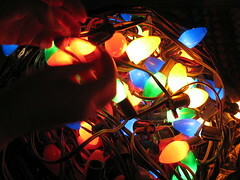 The lights will stay packed in their box with the carefully wrapped balls, hangers and other decorations. We will be celebrating Christmas morning at the kid’s mother’s house but next year we will reawaken the lights, hang the balls and tuck the presents under the tree for safekeeping. Thanks for striking these memories with your beautiful post. I will be thinking of you tonight and tomorrow. Happy holidays to you and yours. R3, Merry Christmas to you and all of the family. I’ll be making my calls in the morning. Ah, yeah, and checking all those bulbs to make sure the whole string will burn. I kind of missed that this year. I remember Mom telling us to spread all the tinsel out, too, so each one would sparkle with the light. Ah, memories of Christmases gone by. Have a good time with the kids in the morning. Will be thinking of all of you. Lots of love! I’m so sorry to hear that Chaco is ill. Sending warm and healing wishes your way for Chaco. I love sitting in the dark and staring at the lights, too. I used to do that as far back as I can remember. I’d sneak down at night when everyone else was in bed just to have a few moments alone with the tree and the lights. Childhood Christmas trees were always heavily covered in tinsel. My brothers (I have 3, all younger than me) would throw it on by the handful. Still, the lights would shine through and provide color to the tinsel and the tree. Merry Christmas, QM, to you and yours. Robin, I can sure relate to the cleaning of the attic. 8) We’ve got quite a bit stored up there. Chaco is showing improvement, little by little. He does have something going on with his kidneys, but also another kind of infection that is showing improvement with antibiotics. Today we had more hope. And we just did his first Sub-Q with the needle and saline solution and it went well. We’re thrilled because we weren’t sure how he’d respond. The greatest gift is having him through Christmas. We’re taking it a day at a time. Thanks for the kind words. I miss having the lights up this year. I kept trying to get to it but just ran out of steam. I watch the neighbor’s glisten in the snow though. It cheers me up. We also have a skating rink pond just across the way with big lights. It’s very snowy outside. Merry Christmas to you, too. And may we all move into a New Year full of hope. Oh yes, those photos bring back so many memories!! Really fun. Merry Christmas to the keepers for the Red Ravine. I have enjoyed my time here this year immensely. QM, so glad to hear that Chaco is improving. I have been thinking about him, you, & Liz for days now. Sending heartfelt energy your way. I love the lights! In fact, just this week A came over & took our huge artificial, though truly real looking, tree to his house. That & many old glass ornaments & tinsel that was still the box. I stopped using tinsel years ago, when one of our cats ate some. It is very dangerous to pets. As we were going through all of my Christmas ornaments we came upon a string of the same lights that are in your photo. I kept those. Great memories that I could not part with. Last year I purchased a smaller artificial tree that is pre-lit. I love it! We haven’t gotten a real tree since the boys were younger. I just stopped by to wish you and Ybonesy a Merry Christmas. I’m sorry to hear about Chaco, but glad to know that he’s improving. Hey, QM, I wanted to wish you a special Christmas greeting. I hope Chaco has improved over the past 24 hours and that you and Liz were able to get some rest and peace. Teri’s family’s old lights are so great—the photos are gorgeous. Like others here, we had these same types of lights, and we used them both indoors for the tree and outdoors mainly around the eave of the roof. It’s hard to imagine such big lights on trees indoors, but that’s all we had, wasn’t it. And they really put off a lot of light, very different from the small lights we have on our tree right now, for example. I miss those old lights. I noticed today that Jim’s parents had these old-style lights on their tree. Also, I loved the poem. It did make something quite ordinary feel extraordinary. goddess, thank you. Hope your Holidays are full of joy. diddy, thanks for the good energy for Chaco. It’s working! And I’m glad you kept the giant string of lights. Yeah, the older bigger tungsten bulbs burn more brightly to me. It’s one area where I don’t mind that they take more energy. When Liz and I were driving around looking at lights this year, we noticed that the LED lights are a lot duller. People say they are brighter but it’s a colder, duller color to me. I much prefer tungsten lighting and I probably always will. We do use energy saving bulbs in our house though. And we looked at buying solar LED lights for the deck and outside tree this year. They even went on sale for 30% off a few days before Christmas. But we decided against it this year. We think they might improve the solar lights as years go on. I guess time will tell! heather and sam and ybonesy and diddy, thanks for your well-wishes for Chaco. And Merry Christmas to you all. Chaco has steadily improved on the antibiotics. And our greatest Christmas gift yesterday was that he finally purred again after a week of hearing nothing. He’s loud, a black Siamese, who purrs often, kind of like a motorboat. So it was so great to see him jump up on the couch yesterday, sit in Liz’s arms and purr. He’s made a lot of progress, slowly getting his energy back. Though whatever’s going on with his kidneys may continue, we are fighting some kind of infection, too. The fight is going well. Liz has learned to give Sub-Q fluids, too, and is getting better at it each day (I do the holding and soothing; I kind of cringe to think about poking a needle into him). Chaco will go back to the vet in the morning for more blood work and to see how he’s doing with all the different tests they do. We can’t really believe how much better he is than a week ago. Thanks to all who have sent their prayers! Liz had to work today and I’m home with Chaco, resting. 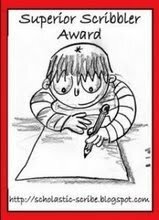 I’d like to read and do some writing. Hopefully, get a little catnap in. Last night was the first night we got a half-decent sleep, knowing that Chaco wasn’t going to fall over somewhere like the litter box and be stuck there. That actually happened the first few days we brought him home. He’s much stronger now.